Hover prides itself on having honesty, empathy and helpfulness among our guiding principles, and it’s clear that we haven’t lived up to that in this case. We’ve prioritized adding a cost breakdown into the renewal notices, which should be rolled out within the next few weeks. As a side note, we currently have a much bigger email overhaul project underway, so instances like this will hopefully soon become a thing of the past. I look forward to see these changes in the next few weeks. I will update this post when these changes are in place. I also got a response back from the support rep (John) that dropped the ball on my original question regarding this. He admitted to this and was ready to answer any additional questions that I had. So far – this is the ‘old great’ Hover that I’ve come to admire and appreciate. You are my favorite^100 domain registrar. I’ve been your customer for years and you have delivered on your legendary customer service (up to now). 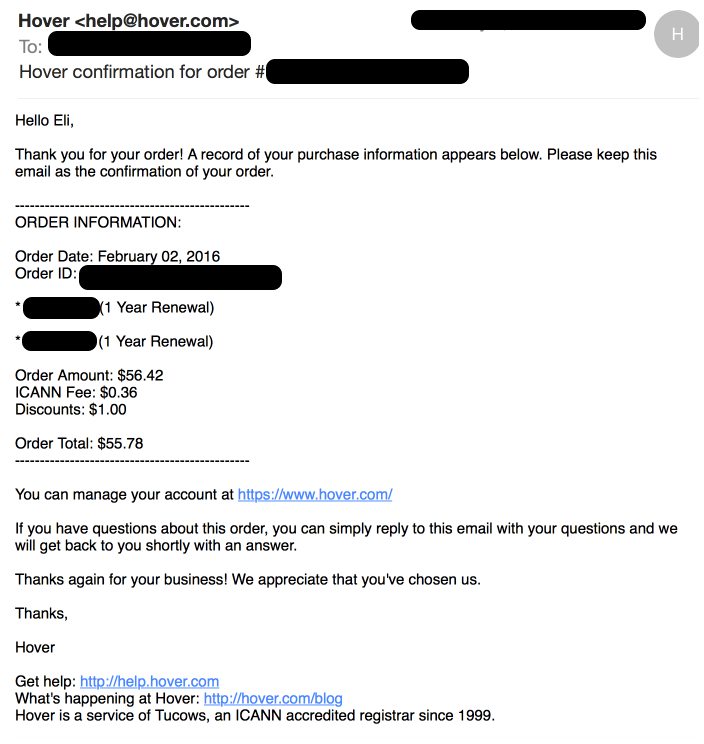 In fact, I’ve used ‘Hover’ as a substitute for great customer service in talking to others – as in “well they’re certainly no Hover…even after you go through the 10 levels of voicemail hell, you still end up leaving a voicemail message” or “OMG – that registrar is the opposite of Hover”. They don’t inform me of my upcoming cost. Even after you charge me for a bunch of domains, you give me an email with a total dollar cost without giving me a breakdown within that very email. Your legendary customer support has fallen on its face in answering my question about this issue nor in remediating this in any way. In this letter/post – I will explain the problem and the best way to remedy the issue. I hope you live up to the great service that you have provided so far. I know there are plenty of registrars out there but so far there has been only one Hover. I hope that you choose to fix this issue. 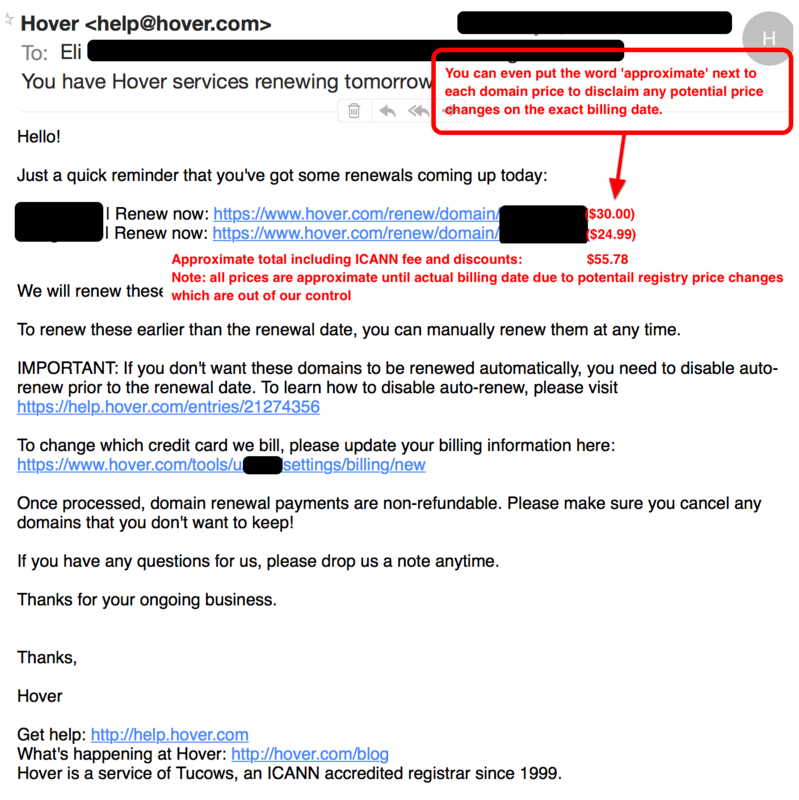 In this section I cover the problem with your renewal emails and how through omission of domain pricing they inherently mis-inform the customer. I’ll admit I’m a bit of a domain hoarder, and you don’t make it easy to avoid purchases through your somewhat awesome introductory pricing. Now there’s nothing wrong with this sort of pricing – that’s totally fine. It’s definitely the thing that pushes me over the edge to buy a domain that I’m hesitant about. Now you might counter that my assumption is totally on me and that’s true…I’m human. This is why I need your technological assistance in making the renewal emails better. Wait – how did I end up with a $55.78 bill? Where’s the per-domain breakdown? The renewal email didn’t have any pricing. Heck – even this receipt email has no breakdown of per-domain pricing. I’ve asked before about domain cancellation after another billing surprise and I got the following response. OK – I get it – you can’t cancel a domain after it has been renewed – fair enough. So how about letting me know the renewal pricing before I renew the domain. How about letting me know the renewal pricing through the domain renewal emails? So I write you an email about these renewal emails. I’ll admit it – I was really ticked off when I wrote this email – I’m sorry about that. I get a response from John (not his real name of course). Say what? 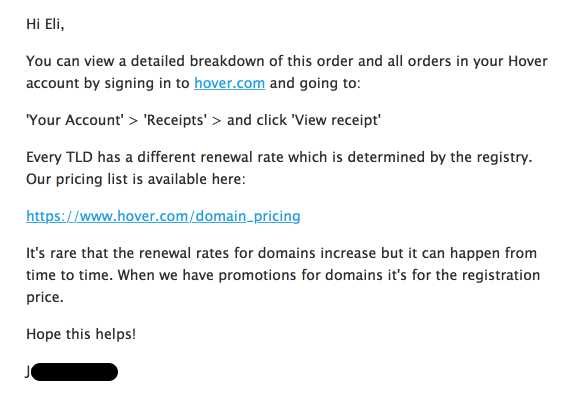 So I need to go to https://www.hover.com/domain_pricing to figure out the pricing that you already know when you send me the renewal emails? Also, first purchase promotional pricing is vastly different than renewal pricing. 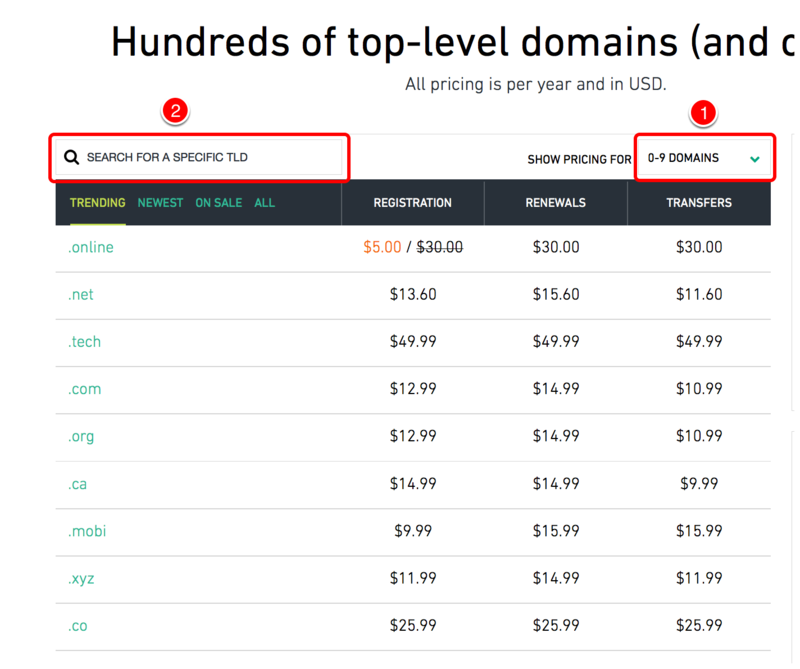 Why don’t we take a look at https://www.hover.com/domain_pricing ? So I need to remember the amount of domains that I have to account for any discounts (1). Then I need to search for the tld (2) and write this down, and then search for the TLD of my next domain and write that renwal price. Then I continue onto the next domain and do the same thing. And finally I need to add the total for my upcoming cost. Really? Now granted – for my 2 domain example this is not that big of a deal. But what about a renewal email for 5 domains or 10? The solution is simple. The whole solution is explained in the following image. I suggest that you include the price of the renewal next to each domain that you list. 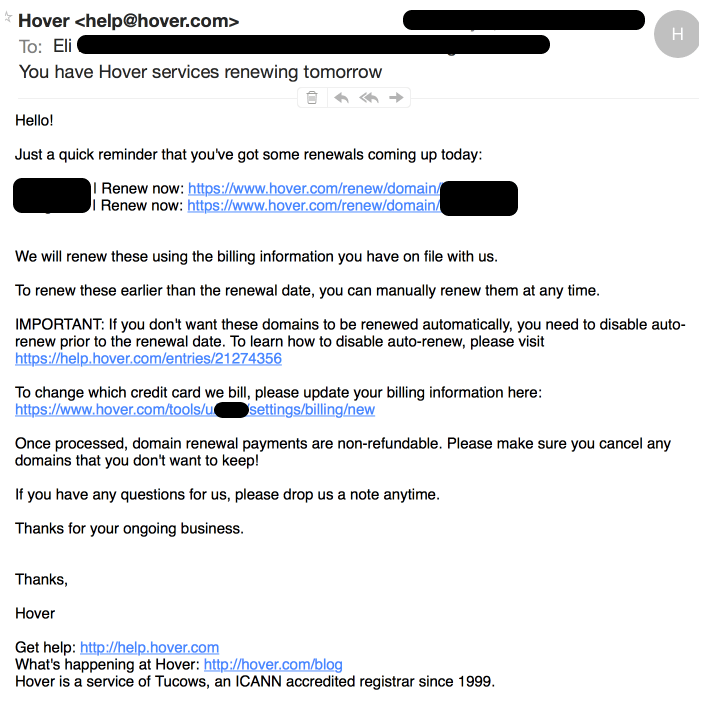 I’ve used the previously shown renewal email as an example. If you want to be even more awesome – include the approximate total too. 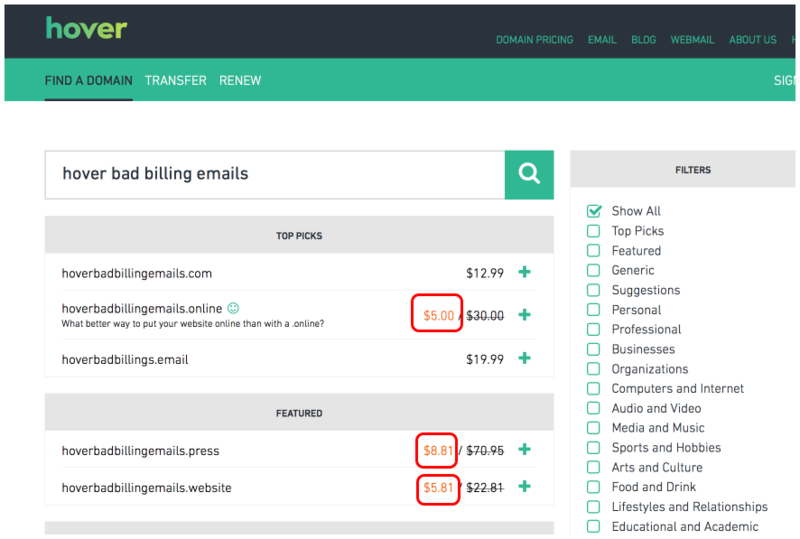 This is a clear honest way to represent the upcoming renewal price for each domain, as well as the overall total. I responded to the customer support email but so far I’ve heard nothing. You’ve been very very silent Hover – why is that? Why has that legendary customer support faltered? As your loyal customer – I’m here to help. This is why I took the time in writing this letter and included a solution specification (seriously). The solution is simple if not a bit obvious. Will it cost you some revenue because your customers wont let a renewal occur based on blind price assumption – maybe. But you’ve chosen to be a Hover – you’ve chosen to be better than other registrars in dealing honestly with your customers and in providing great customer service. I hope you can approach this renewal email issue in the same way and fix this problem. Next Next post: Thanks Hover!